Type Ahead feature enhances the user experience in SRM UI5 Enterprise search screen by providing the suggestion list as soon as the enters a minimum number of characters(configurable) in the search box. 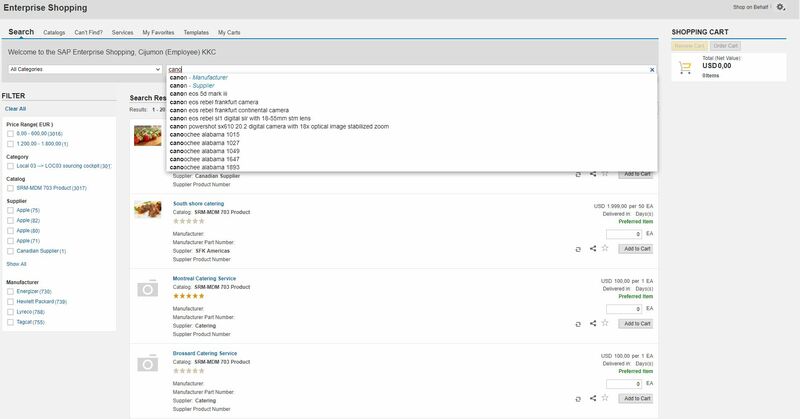 The suggestion list is displayed almost instantly with great performance(milli-second response time for more than 3 million products in the enterprise search). Star Sugg Value – The minimum number of characters to type before triggering a suggestion. A recommended value would be 3. Note: A value of 0 will default to a value of 8000 during the execution. Note: The fuzziness value is only taken into consideration when 4 or more characters are typed regardless if the Star Sugg Value is less than that. Max Results – The maximum number of items to display in the type ahead suggestion results list. Note: The Max Result value is for actual catalog items, result types such as Supplier, Product Category, Catalog name are not considered as part of the max result and will be additional to the max result.